Learn how you can easily make this fabric flower fall wreath by using strips of scrap material or cheap remnants from the fabric store. One of my favorite ways to decorate for the change of seasons is to create a new wreath for my front door. Fall is especially fun because you get the chance to work with so many rich autumnal colors. Last year I made a pumpkin centerpiece wreath filled with faux flowers but this year I decided to make my own fabric flowers. It’s a little like the felt flower fall wreath I made a couple of years ago, but even easier. 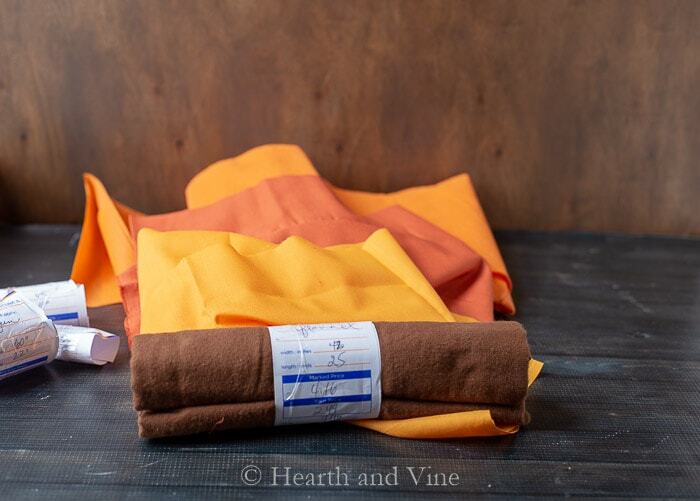 You can use scrap fabric that you have on hand, but if you don’t have enough pretty colors, then check out the remnant section of the fabric store. There you can find lots of options for a fraction of the cost. I started this project by using scraps of drop cloth material left over from my porch pillows and cushion covers. I really like the casual feel of this inexpensive fabric and the way it frays on the edges. To make a flower, start at one end and hand sew even stitches. Here I’m using a double threaded needle with a knot at the end. Once you get to the other side pull on the thread, gathering the fabric. 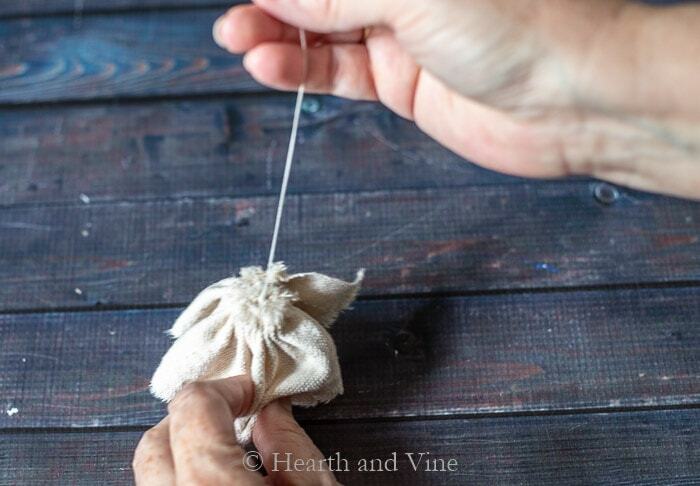 Once you have gathered the strip tightly, stitch a knot on the end. 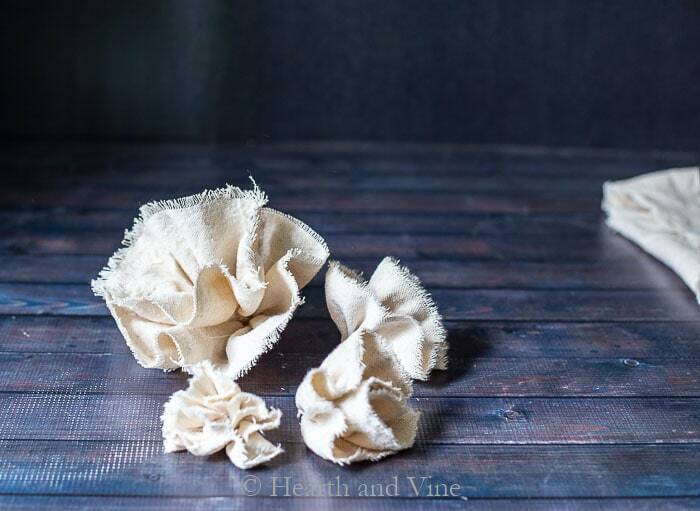 Finish the fabric flower by tying several knots on the gathered end from side to side at different intervals. I made three different sizes but you could vary the lengths to work with the fabric sizes you have on hand. 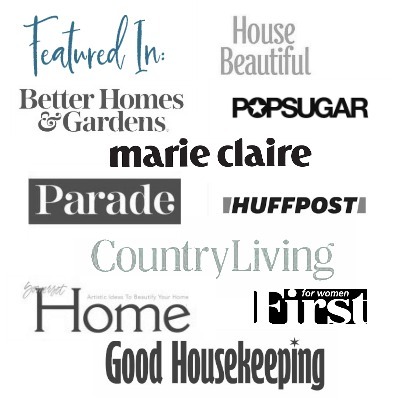 This is a great project to make while you watch TV at night because it takes a lot of flowers to fill this wreath and you can easily sew and gather strips a few at a time. I ended up using about 35 flowers on this 18-inch grapevine wreath . I like grapevine wreaths because they are inexpensive, look good, and provide lots of surface area for gluing the flowers. And if you have some wild grapevines growing in your yard you can make your own grapevine wreaths for free. Once you have all of your flowers simply hot glue them onto a wreath frame. Above is a picture of the first draft. It’s a good idea to look at the wreath before hanging to see if there are any gaps. As you can see I have a couple of holes but it was easy enough to create a couple of additional flowers to fill in any bare spots. Here’s a closeup of the flowers. I love that they all have different textures in addition to color. I think a wreath with all drop cloth flowers would be really pretty too. However, I just couldn’t resist adding some autumnal beauty to commence fall. Here’s the final product on the front door to greet my guests. 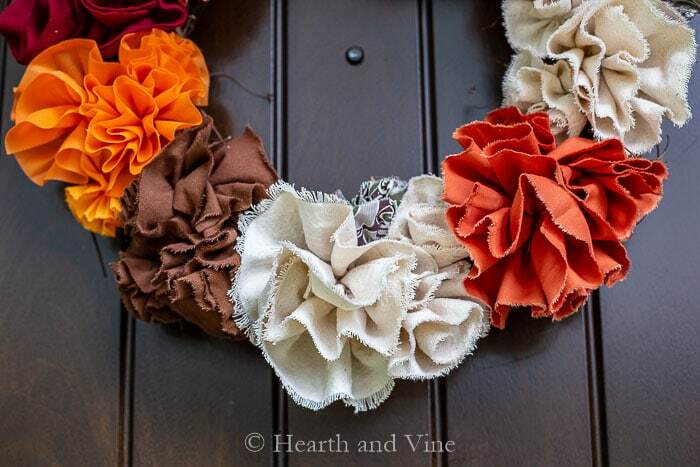 This fabric flower fall wreath is a great way to kick off the season. Stay tuned for more fall fun. So super easy, and love the colors your chose! Pinned! What a fun idea, so simple but not over the top which I really love. The fact that you hand stitched means I could actually make something like this. I may have to think about that after I get all my transplanting finished. Love the color combo!! Thanks Carole. It did take a little time but soo easy.